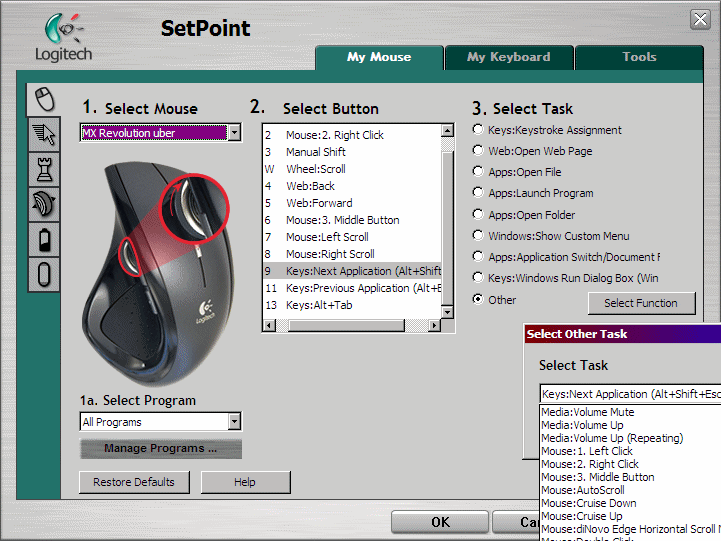 SetPoint's default settings won't let you change settings on some buttons (such as Left Button, Right Button, and Tilt Left/Right on mice; and volume and media control keys on keyboards). On older versions of SetPoint, the Forward and Back actions don't work with Firefox, Opera, SlimBrowser, or Maxthon (they need another AppOverride to tell SetPoint what keystroke to send, since Logitech didn't just have them send the normal mouse4/mouse5 events for unknown apps). Install my uberOptions pack to change the device settings for SetPoint! All it took was editing some XML files. Since the Forward/Back actions use Application Specific settings on those buttons to send different events depending on what exe has focus, the fix I'm using only works for the default two buttons. If you want to do Forward/Back in Firefox/Opera 8 on another button (or reversed for that matter), use the "Keystroke" action with "Alt+Right"/"Alt+Left". These modified files work with SetPoint 2.22 - 4.80 (and probably later versions, too - but not the special "SetPoint 5.0/5.1/5.2" for the G9/G9x mice). If you are using an older version of SetPoint, install the newest available version (4.80) from Logitech's support site or FTP first. Works with SetPoint 32-bit and 64-bit for Windows XP/XP x64, Windows Vista 32bit/x64, Windows 7 32bit/x64. My main computer now runs Windows 7 x64, so tell me if you have problems with other OS versions. Always uninstall uberOptions before updating SetPoint. After you have finished updating, re-install uberOptions. The current uberOptions does work with SetPoint 6.00+ mostly, you just have to specify the new locations of the files uberOptions needs to install. Note: the \ProgramData folder is a hidden folder, but just try copy and paste of the exact folders above. I don't have an ETA for when uberOptions will directly support SetPoint 6.00; I recommend sticking with SetPoint 4.80 for now if you are using Windows 7 or XP (Windows 8 reportedly requires SetPoint 6). Note: uberOptions probably won't be updated until my current mice die and a new one requires SetPoint 6.x+. Or if someone gave me a mouse that required SetPoint 6.x. As it stands now, I'm happy using SetPoint 4.80. To enable editing of the left and right mouse buttons in SetPoint, install uberOptions and pick the "Editable B1 and B2" defaults. Note the side-effect that those buttons will not function in some low-level programs like the Ctrl+Alt+Delete Windows Security screen, ZoneAlarm firewall, Vista's UAC, and maybe a few others, where you will have to only use the keyboard. 3. Run that .ahk file before starting your game. It will appear as a green "H" icon in the System Tray. It remaps the right mouse button to send the "w" key, and the right Alt key to send the right mouse button. 4. After your game, right-click the "H" icon in the System Tray and close the macro. Use the right Alt key to right-click. Delete your user.xml settings file from %userprofile%\Application Data\Logitech\SetPoint\user.xml to reset to the new defaults. Go to start->run and paste in %userprofile%\Application Data\Logitech\SetPoint That's the user.xml to delete (with SetPoint closed first) to reset to the new defaults. Restart C:\Program Files\Logitech\SetPoint\SetPoint.exe or reboot. Make a copy of the user.xml file in that folder. This file contains all of your SetPoint settings. Backup gamelist.xml if you use the Game Detection feature in SetPoint. Download and re-install the newest uberOptions from this page. Either don't re-load SetPoint at the end of uberOptions installation, or close SetPoint from the System Tray after it re-loads. Restore your user.xml from the copy you saved in step 2. Eventually, I hope to have fixed the settings for all the devices that SetPoint supports, but I'll need help from users who actually have the devices to test my modifications. If you have one of these devices and want me to uberfy it, contact me by email to moc.liamg|snewolr#moc.liamg|snewolr Note that if your device isn't already seen by SetPoint, there isn't anything I can do to add support for it.